This Ibis hotel in Spandau offers air-conditioned rooms, early/late breakfasts and a 24-hour bar. It is directly next to Spandau Train Station and Rathaus Spandau Underground Station. Free WiFi is available in the rooms. The Hotel Ibis Berlin Spandau is in the Spandau Arcaden shopping centre. 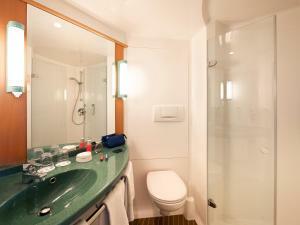 The modern rooms have satellite TV, internet access and a private bathroom. A breakfast buffet is available every morning from 06:30 until 10:00 (11:00 at weekends). A small sweet breakfast is also available between 04:00 until 06:30 and again until 12:00. Snacks and drinks are served 24/7 at the Ibis Berlin Spandau's bar. Spandau's Old Town is about 200 metres away from the Hotel Ibis. The famous 16th-century Spandau Citadel is a 20-minute walk through the Old Town or 2 underground stops away. Modern room featuring air conditioning, satellite TV, and a private bathroom with hairdryer.